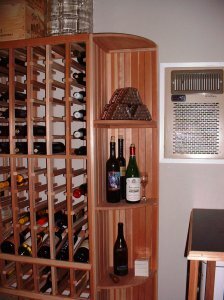 "My newly built home office was big enough for me to incorporate a small working wine cellar into it. I thought of everything I wanted in order to improve quality and up production (>50 cases) - this is what I came up with. The cellar is climate controlled, can hold 592 bottles of wine, 6 carboys, 4 - thirty gallon wine barrels, files/records and most winemaking equipment. Additionally, it's a great humidor where I presently store about 400 cigars. I looked at a lot of components and your racking system fit in perfect with my plans and helped me to maximize space. The only modification I made was to the cardboard box racks to accommodate carboys and cigar boxes. Thanks Rosehill Wine Cellars for your assistance throughout this process."